Light, persistent, and powerful notebook. The Lifebook S6410 is a light, compact, and fast notebook, equipped with Dual-Core-Ultraportable processor, which rates good in our review. The solid and sophisticated case and the additional security features make it a general-purpose and reliable companion. The S6410 is suited for demanding business and private customers. 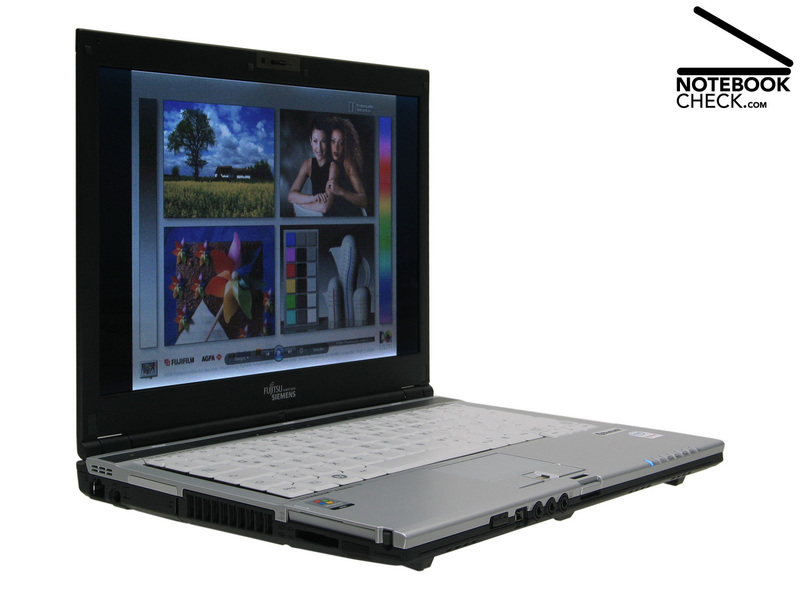 Fujitsu-Siemens (FSC) presents an about 1.8 kg light, portable, and powerful 13.3 inch notebook of the ultra-portable subnotebook class, the Lifebook S6410. Due to compact dimensions, i.e. 31,3 x 23,3 x 2,4 to 3,5 centimeters, it is easy to transport it in standard bags. Available for about 1,650 Euro, the Lifebook S6410 is ex factory delivered with further accessories, like a convenient notebook bag and a cable for modem connection. 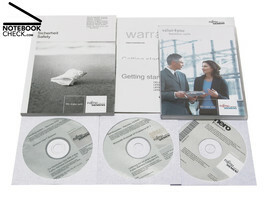 Even optical recovery data media for the operating systems Windows XP Professional, Windows Vista Business, and CDs for Nero 7 Essentials, a burning and media software, and the business-bundle, value4you business suite (Corel WordPerfect Office X3, Babylon 6 – translation @ a click, and Adobe Photoshop Elements 5.0) are included. 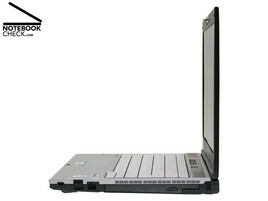 Beyond doubt an eye-catcher: The razor-thin lid of the Lifebook S6410 attracts attention at once. Despite of the very thin design, its stability is amazing, however, its pressure resistance and flexural rigidity are due to the construction method limited. Clear interference of the display can be provoked by pressing ones finger even slightly more forceful in the center of the lid or in the upper LCD-frame. So, you should take care that nothing hard bears against the lid, if you transport it in the supplied bag. The hinges are alright, and can easily handle the light LCD display. The display is hold tightly in its position, so, that it won't even see-saw at a bumpy train ride. 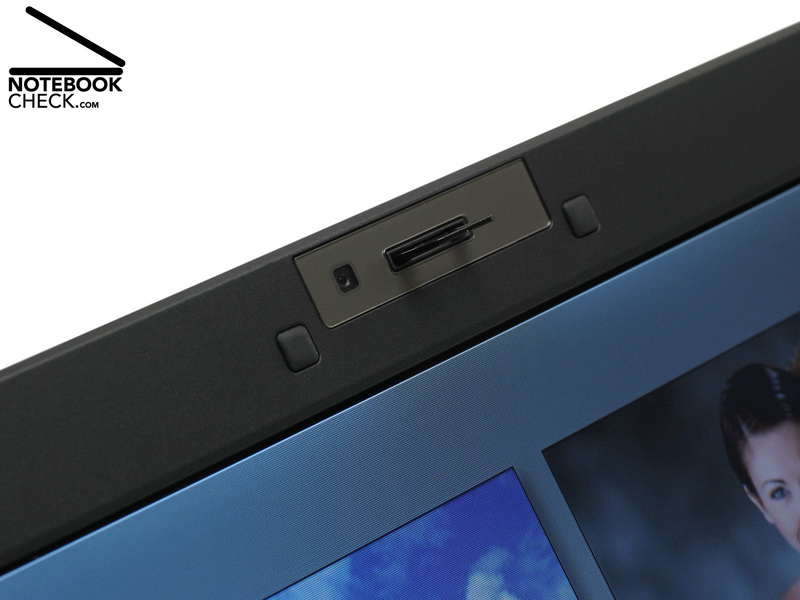 A nice add-on of the Lifebook S6410 are the built-in web cam and two microphones located in the upper display frame. The quality of the recording is sufficient for video telephoning over IP or entertaining video chats. However, you should not expect photo quality of the very small camera. 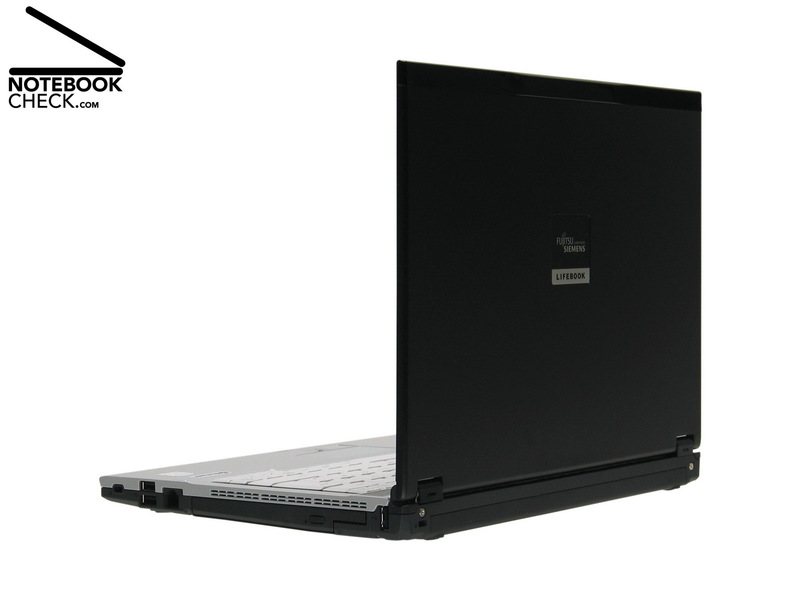 Despite of its lightweight construction there aren't loud creaking noises, when lifting the Lifebook S6410 by one hand only. 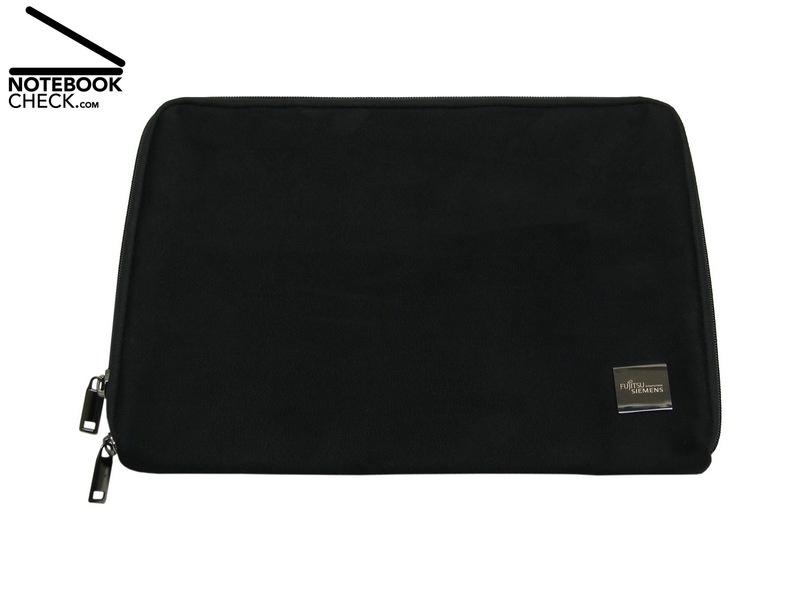 The decent black/silver notebook, appears to be comparable solid, considering its thin and lightweight construction. Top and bottom trough twist only slightly when holding the S6410. The big and easily legible indicator LEDs for battery/mains operation and mass storage access are at the right front edge of the upper trough. Left beside it, beside the central release button are the standard audio ports, a Firewire port (IEEE1394), and an S-Video-interface. A sliding switch, totally at the left, improves user-friendliness by providing a quick way of enabling or disabling all wireless communication, i.e., Bluetooth, UMTS/HSUPA, and Wireless LAN. 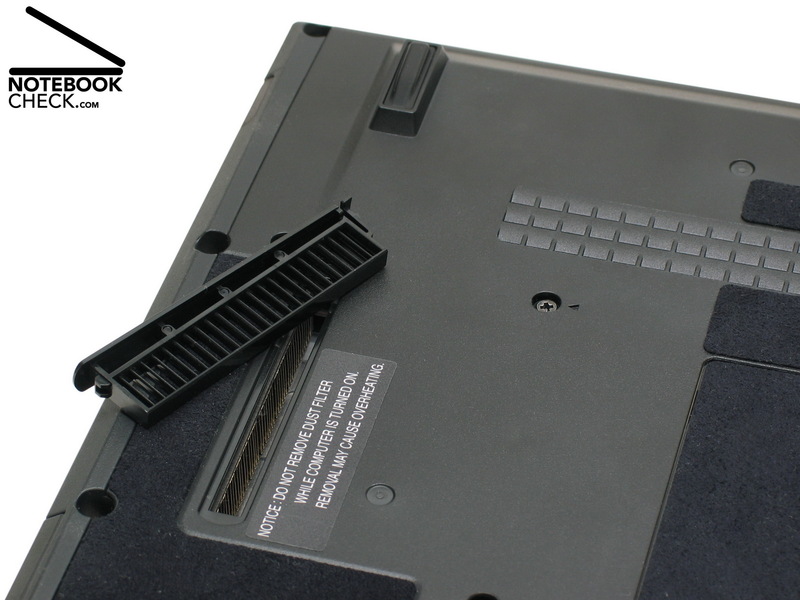 If you do not require an optical drive and need a battery runtime of a whole working day, you can, instead of the DVD drive, insert a supplement battery into the modular slot. 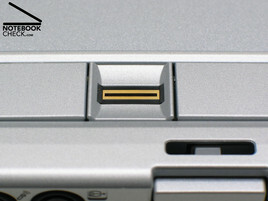 Another special feature of the S6410 is the SIM slot, which was integrated in the first battery slot. It can be used to connect to the Internet via fast UMTS/HSUPA. 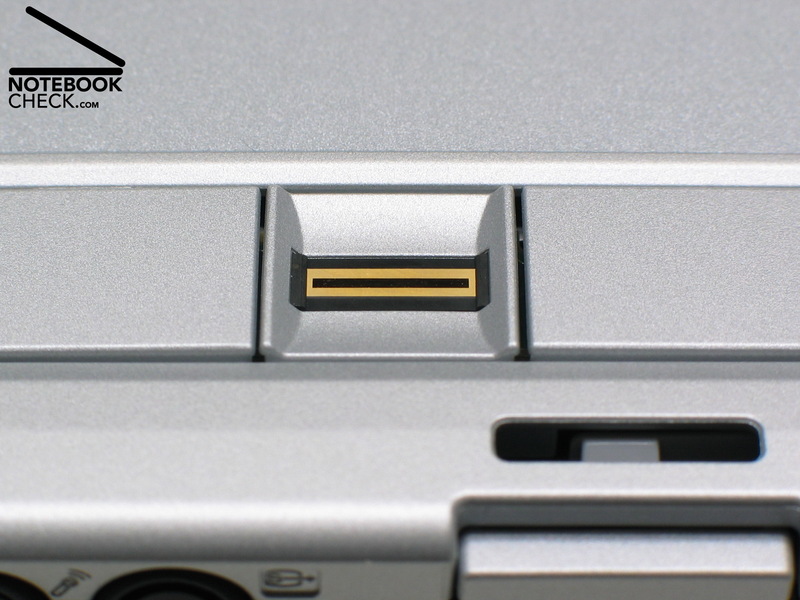 Due to an special interface at its bottom side, the Lifebook S6410 can be connected to an optional port replicator. So, the annoying repeated connection and disconnection of cables to peripherals can be avoided. Furthermore, the port replicator also provides additional interfaces, e.g., an digital DVI port, which can be used to connect a high-quality external flat screen. 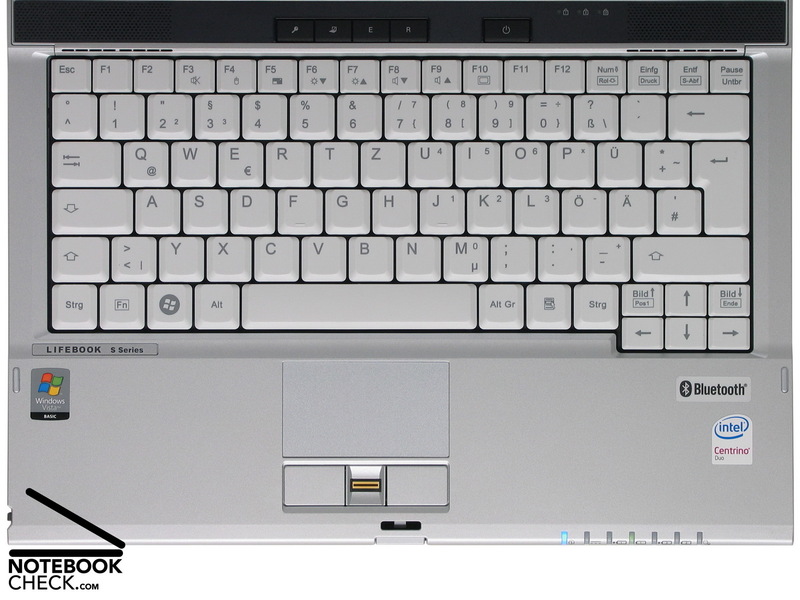 The bright gray keyboard of the Lifebook S6410 provides 85 keys, which is acceptable considering the notebook class. Due to mainly standard layout it is user-friendly. Only the Del key is located right above the "pause" button. The main keys have a size of 1,3 x 1,5 centimeters, which is comfortable, and even the somewhat smaller function and cursor keys can be used without problems. The keyboard's mechanical properties are also alright. Despite of moderately springing and a slight instability at the key head's flanks, the haptics of the Lifebook S6410's keyboard are rather alright. Travel and stop are usually a matter of taste. 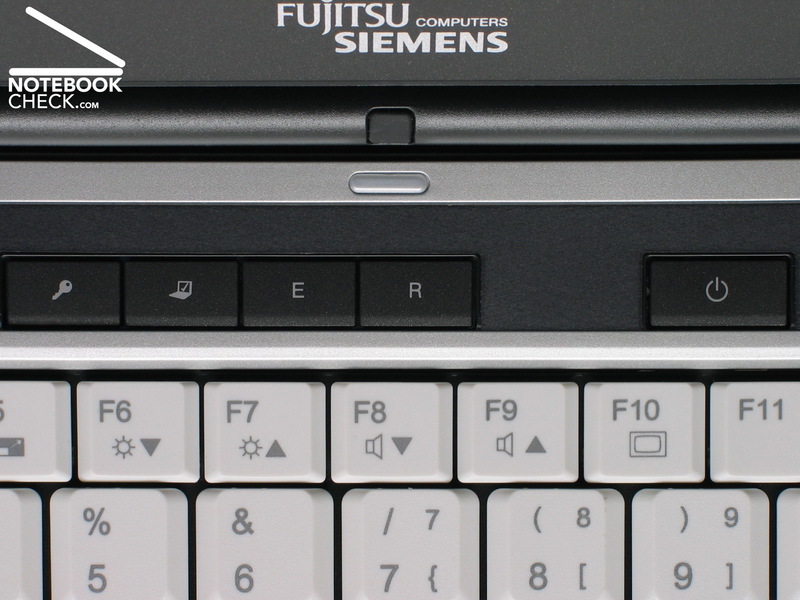 Useful: The input device of the S6410 is according to Fujitsu-Siemens spill-proof. Though we didn't prove the manufacturers statement, you can assume that the keyboard will survive some raindrops, or some splatters of coffee etc. 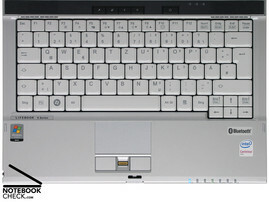 We also liked the Lifebook S6410's silver touch pad. Considering it is a subnotebook, the 6,6 x3,8 centimeters tall mouse replacement is comfortably big. Furthermore, it nearly seamlessly merges with the palm rest areas. The touch pad works precisely and we liked the haptics of the slightly roughened surface. It should be possible to quickly and precisely navigate with dry and sweating fingers. Having a short travel, the two touch pad buttons work comparably quiet. In between them a finger print reader is provided. It eases the authentication of the user. However, the width of the sensor vat is rather small considering the size of men's hands. In addition, the rather lowly set in sensor complicates the correct detection of the fingerprints - some practice might be necessary. 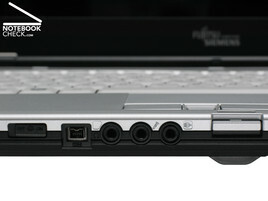 Located left beside the power switch, four additional hot-keys make the Lifebook S6410 even more user-friendly. They provide a quick launch of the Mobility Center, activation/deactivation of energy saving settings, launch of the backup and restore dialog, respectively logging out. Furthermore, the hot-keys can also be configured according to user demands - great! The 13.3 inch WXGA display of the Lifebook S6410 already attracts attention by its very thin construction with LED background lighting. But, also the base brightness in mains operation amounted to very good 223 cd/m² in our measurements of light density. Even during battery operation the average light density of the panel with 1.280 x 800 pixels resolution of 220 cd/m² is excellent. 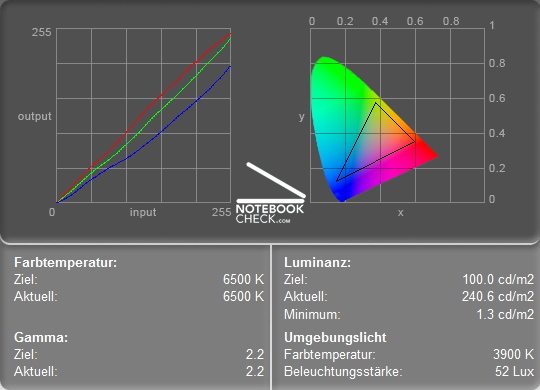 So, the Lifebook S6410 is in the front rank of the very mobile subnotebooks regarding brightness. Particularly with regard to brightness, the S6410 would be proper for outdoor usage. However, the reflecting display unfortunately nullifies this advantage in bright environments. The homogeneity of the brightness is also not totally convincing. It seems a little unbalanced. During mains operation the measurement values of 247.5 cd/m² at the left center and of 180.4 cd/m² at the right bottom corner differ by about 27 percent. The percental difference of nearly 22.4 percent is smaller during battery operation, where we measured 242,3 cd/m² respectively 188,1 cd/m² in the above mentioned measurement segments. 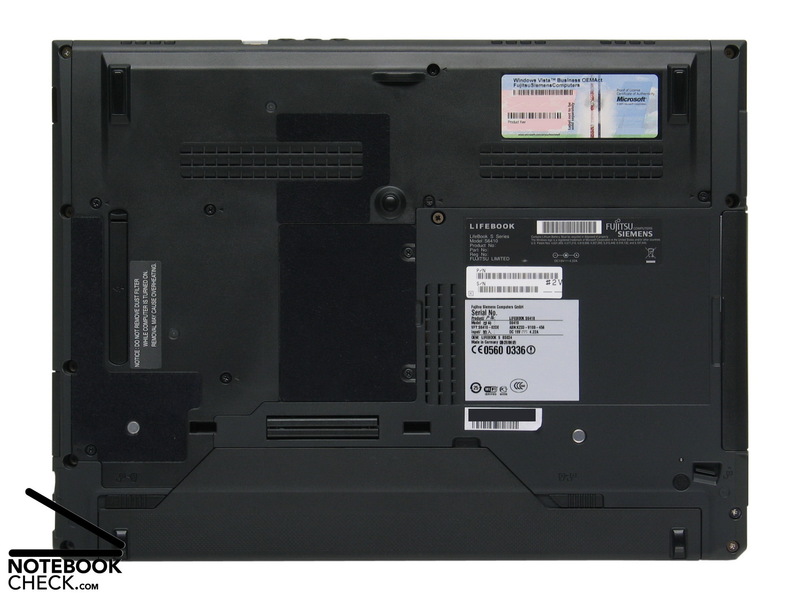 The LED-lighted LCD of the reviewed notebook did also subjectively not appear really homogeneously illuminated. Both of the bottom corners appear to be clearly darker than the other segments. 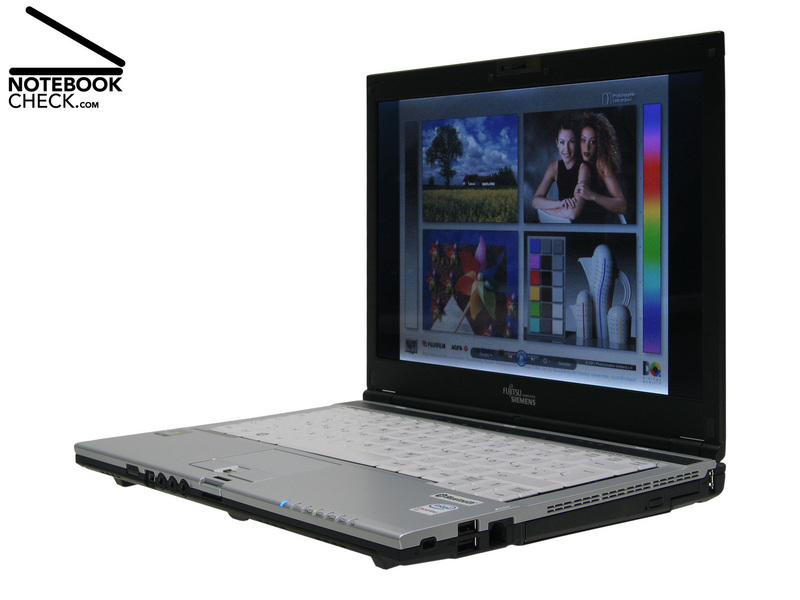 The Lifebook S6410's 13.3 inch LCD panel in wide-screen format scores points by good contrast and brilliant luscious colors. 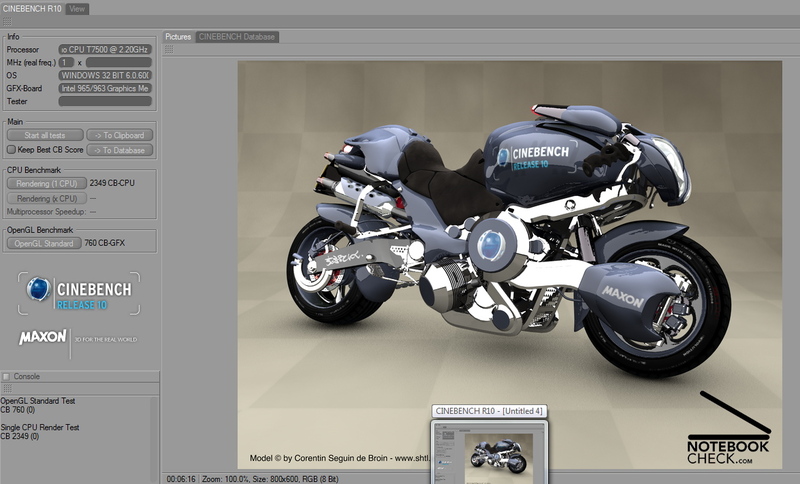 Although the calculated contrast ratio is, due to a relatively high black value of 1.3 cd/m², only 190:1, the reference pictures subjectively look good directly compared to the calibrated reference screen, a Viewsonic VP2030b, including even portraits, which are difficult to compare according to the level of color neutrality of the S6410's WXGA display. Compared to some other 13.3-inch-LCD panels, the one of the S6410 looks rather alright. 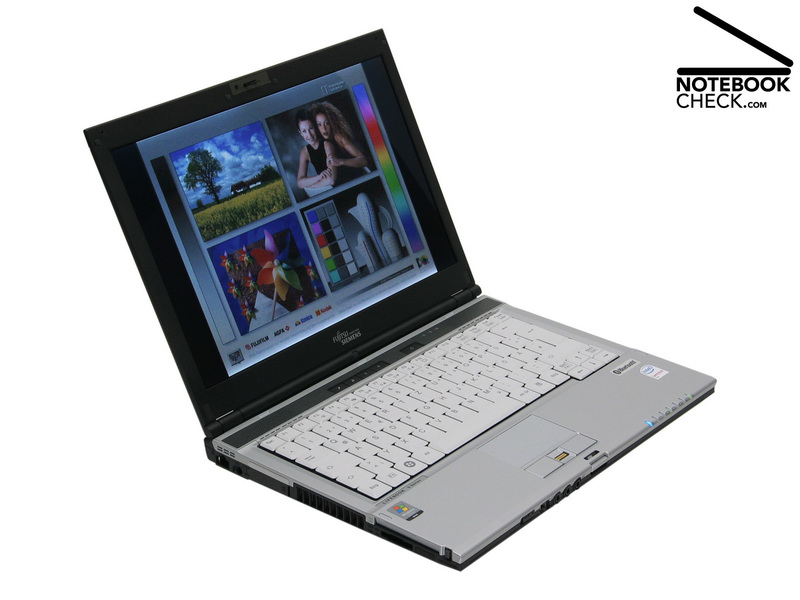 The evaluation of the viewing angles of the Lifebook S6410 did not bring up any surprises. Typical TN-Panels (TN, Twisted Nematic) the possible viewing angles are limited. Horizontally, the viewing angles are comparably still rather big, but, vertically it was clearly more difficult to ideally adjust the opening angle. The dominance of the background lightning could also be to lesser extent. 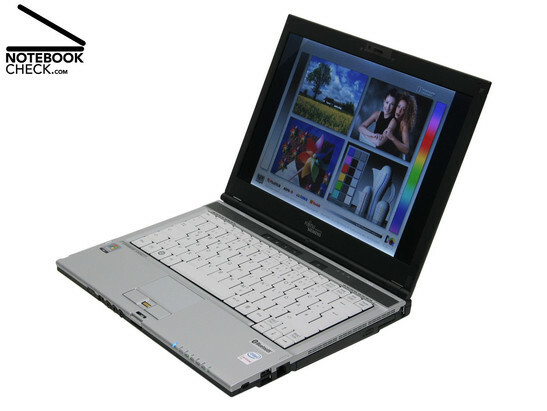 Regarding these aspects, the Lifebook S6410 is only satisfactory. 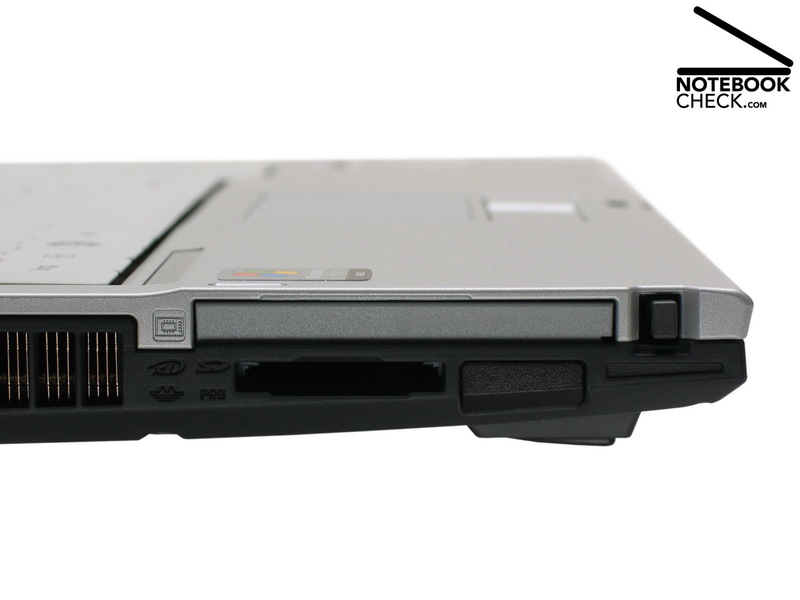 Let us start by saying this: We were impressed to find such powerful components in the light and compact Lifebook S6410. It is based on Intel's fourth Centrino generation Santa Rosa. Hereby, the Mobile Intel 965GM Express (codename Crestline) is used. So, the S6410 comes, due to GM chip-set also with Intel's integrated video chip, the GMA X3100. Equipped that way, the mobile S6410 provides good calculation power and solid video performance for office applications. 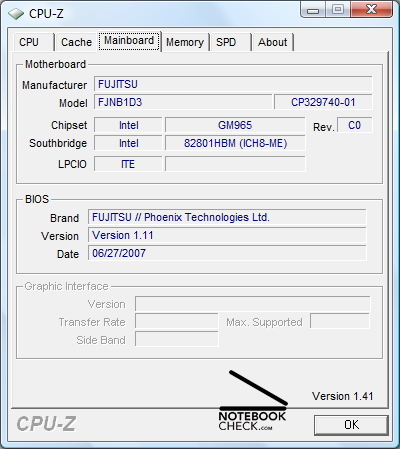 CPU-Z-Information about FSC Lifebook S6410. 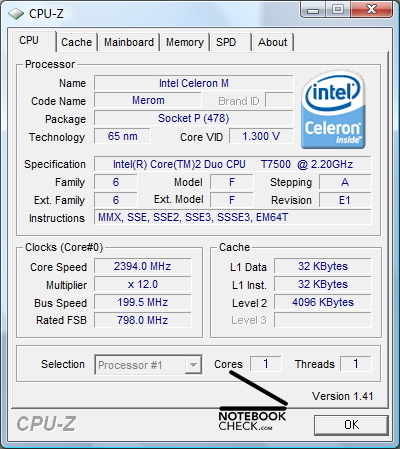 Intel's Core 2 Duo T7500 (codename Merom) with 2,20 GHz clock-rate per core, 4 MByte Level-2-Cache, and 800 MHz FSB provide good performance for mobile working days. 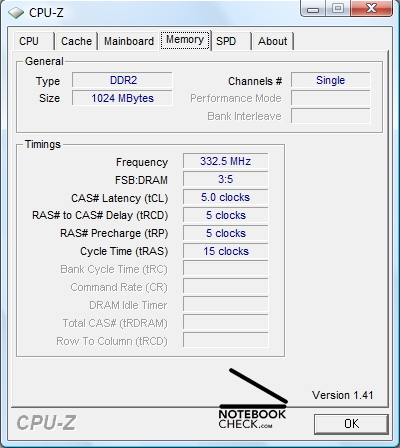 One fast DDRII-667-memory (PC2-5300) with a capacity of 1.024 MByte uses one of the two RAM slots at the bottom side of the notebook. 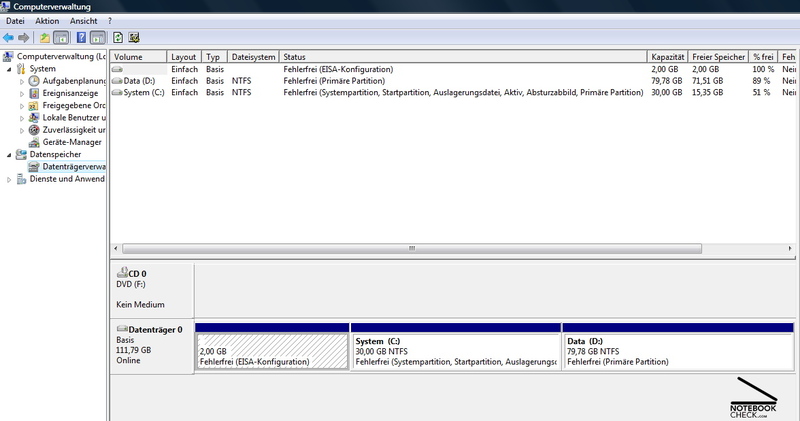 Considering that the installed Windows Vista Business demands a lot, the provided main memory capacity seems very low. However, the second RAM-slot is free and can be used to quickly upgrade the main memory capacity. 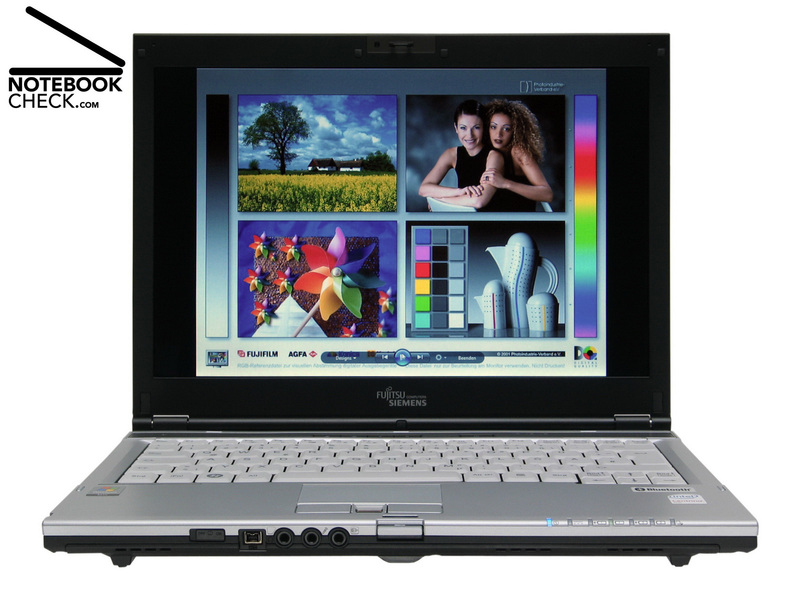 In order to work with low energy demand the Lifebook S6410 utilizes the frugal GMA X3100 video adapter. 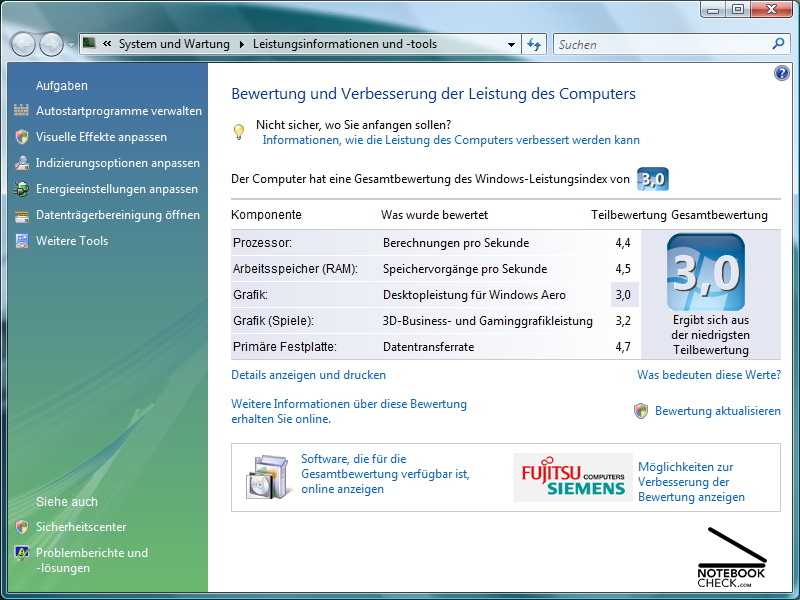 So, the video performance is sufficient for standard office applications and for Windows Vista. 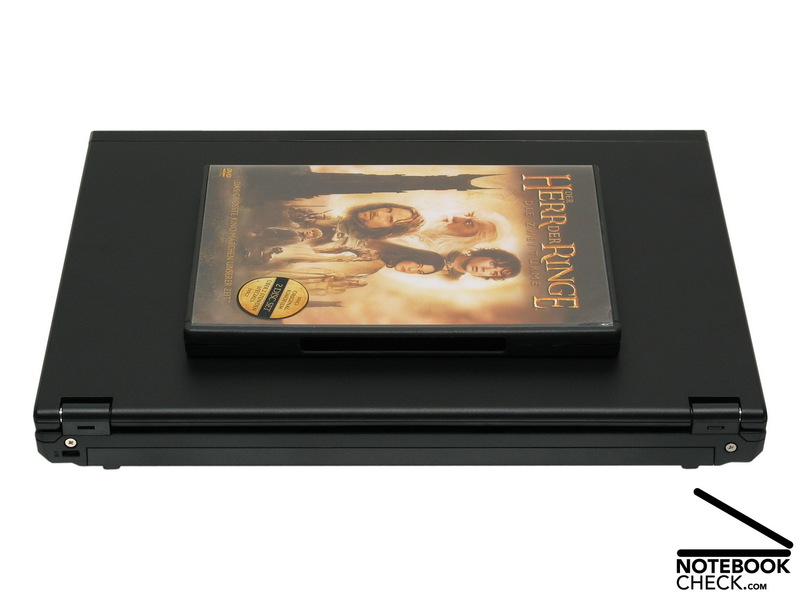 However, the 3D-performance of the X3100 is only sufficient for older or little demanding games in low resolution. 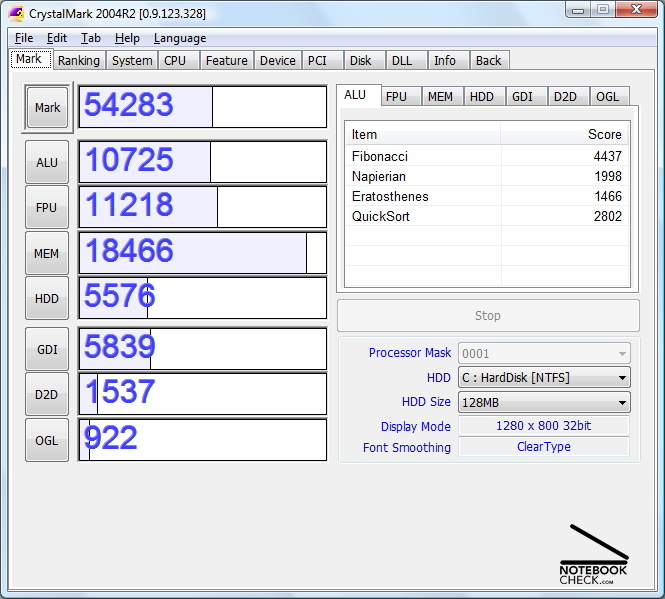 Depending on the driver settings the Lifebook S6410 reaches as expected 1.197 points in the 3DMark2003 benchmark test, which proves that its 3D performance is 'only' low. 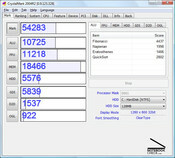 Benchmarks with the FSC Lifebook S6410: Windows Vista Performance Index, Cinebench R10, and Crystalmark 2004. 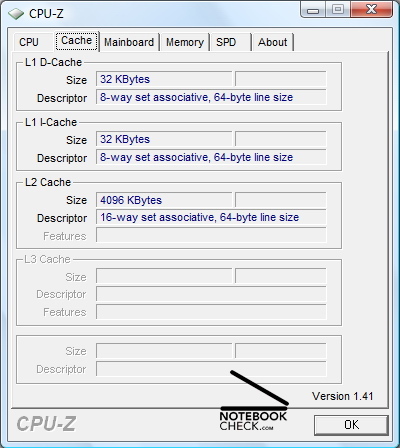 Considering it is a subnotebook the Lifebook S6410 comes with mass storage of relatively high-capacity, i.e., a 120 GByte Serial-ATA-hard disk, in more detail a ST9120822AS by Seagate with 5.400 revs/min. 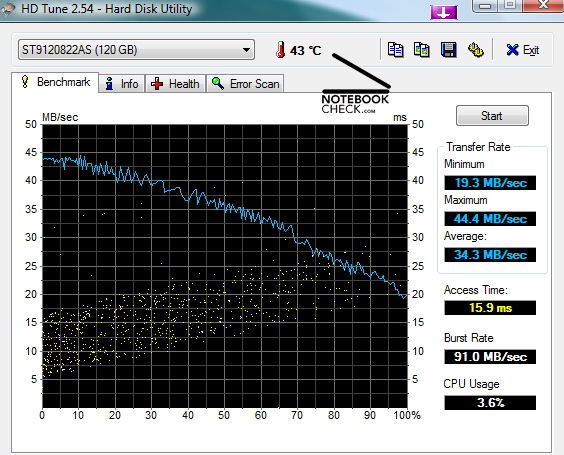 The hard disk benchmark HDTune results in an average transfer rate of 34,3 MB/s, which is alright considering the notebook class. Although the 100 GByte reference hard disk by Seagate, the ST910021A with 7.200 revs/min, attached to the same interface, has an average transfer rate of about 38 MB/s, which is nearly 10 percent higher, the time demanded for storing data is alright. 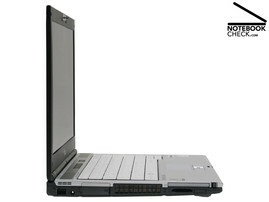 In addition, the S6410 provides a further mass storage device, an optical drive UJ-852S by Matshita in a modular slot. That way, it can be replaced by a supplement battery, if needed. The noise level of the Lifebook S6410 of 36.5 dB during Windows idle mode and when utilizing Eco-mode (energy saving mode) is pleasingly quiet. 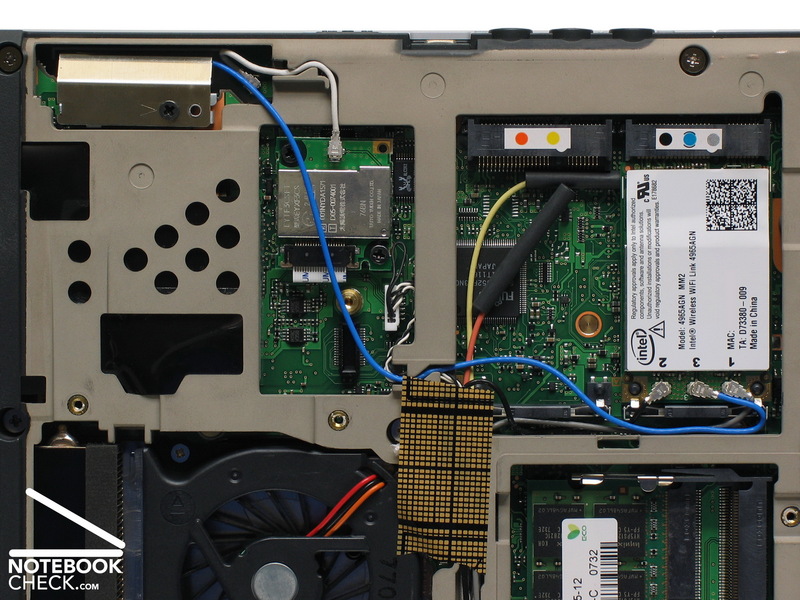 With this modes of operation the S6410's noise level is rather low, furthermore, the fan does not have an annoying high-frequency noise. 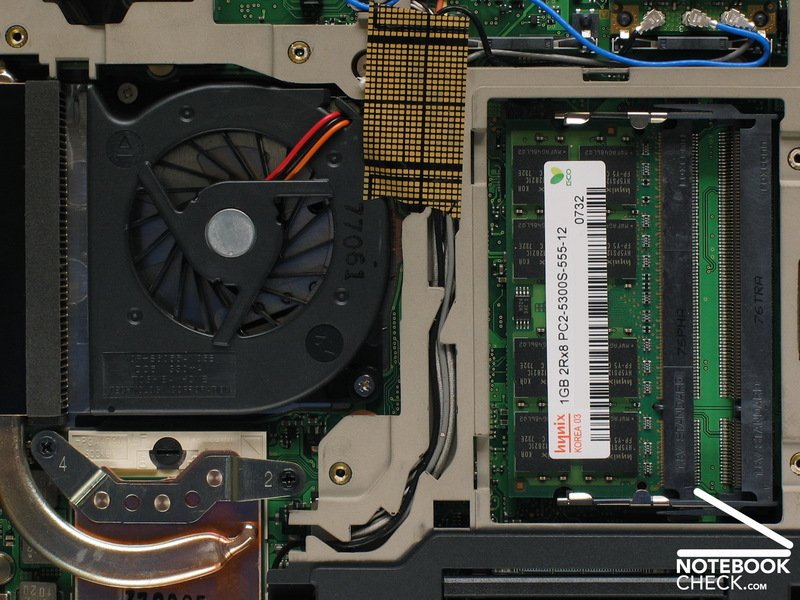 Immediately after reactivation from standby, the fan runs for a short time very fast. We measured a peak of as high as 48,3 (!) dB. During hard disk access and moderate performance demand, e.g., when copying data, the S6410 reaches a noise level of about 39 dB, which is clearly audible, but not annoying. When watching a DVD video the noise level increases to clearly audible 41 dB. However, searching data on the DVD drive is really loud. We measured a noise level of 50.2 dB, accompanied by the high-frequency sound of the UJ-852S by Matshita. Compared with this, even the maximum noise level of 42.9 db under full load, measured when running Prime95 or video benchmarks seems rather low. Measured by contactless infrared sensor, the temperatures of the compact and thin Lifebook S6410 were surprisingly throughout moderate. 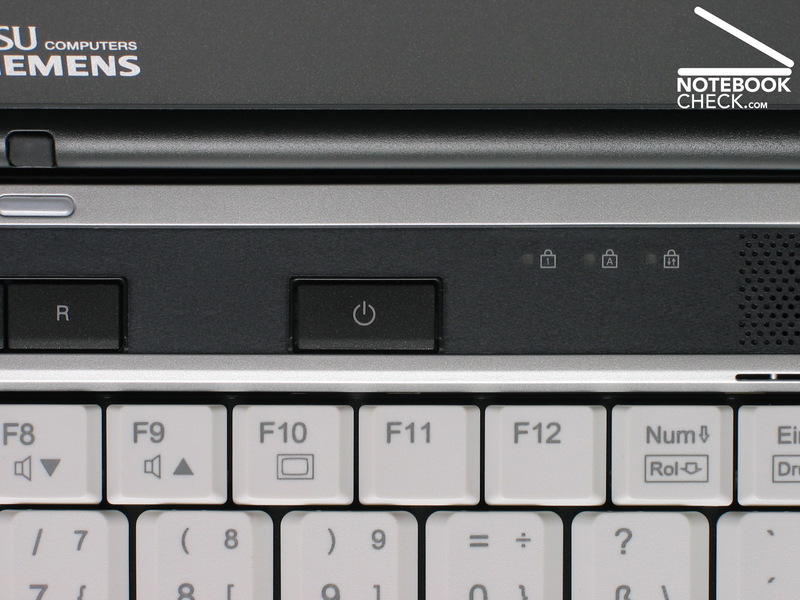 The warmest region of the top side is the left keyboard area. But, the measured temperature level of 37,4 °C is still pleasingly low. The left and right palm rest area stay also with temperatures of 25,6 °C respectively 23,9 °C conveniently cool. Also the bottom side of the Lifebook S6410 is relatively cool. In the left region next to the fan we measured harmless 40,6 °C. Next to the communication modules at the left side near the front the temperature amounts to 33,6 °C and 27,0 °C next to the hard disk, which is clearly cooler compared to some other ultra-portable notebooks. So, the temperature is also at the bottom side alright. In this context a nice and useful feature of the S6410 should be mentioned too. 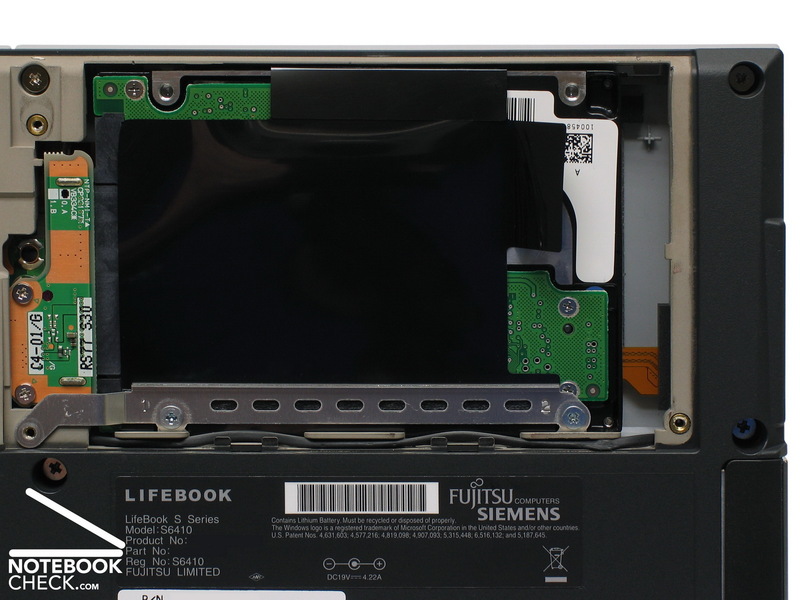 The Lifebook comes with an air filter at the bottom side, which can be easily accessed. 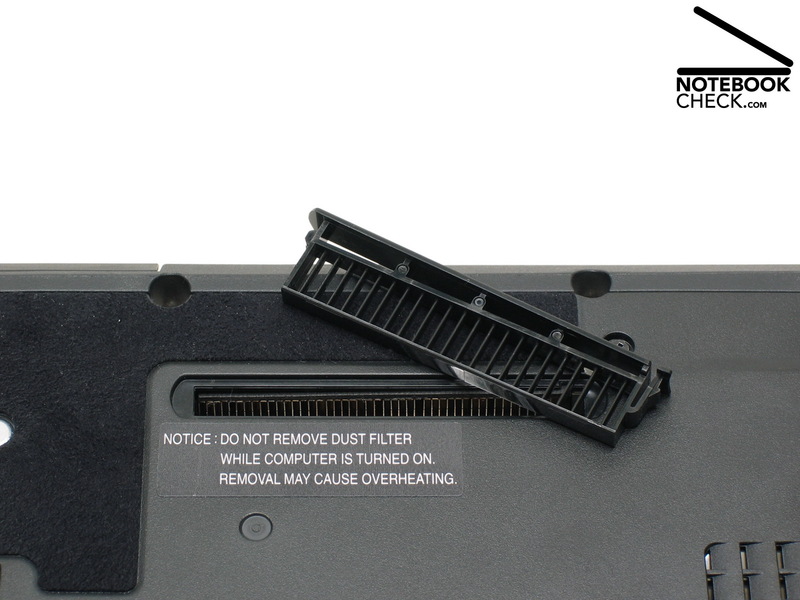 If you use the S6410 in the office or also outdoors many hours a day, you do not need to completely remove the maintenance cover in order to clean the fan. Instead is is possible to simply take out the air filter and clean it by compressed air - excellent! (±) The average temperature for the upper side under maximal load is 32.7 °C / 91 F, compared to the average of 30.7 °C / 87 F for the devices in the class Subnotebook. (+) The maximum temperature on the upper side is 37.4 °C / 99 F, compared to the average of 35.8 °C / 96 F, ranging from 22 to 57 °C for the class Subnotebook. Running idle, having all energy saving settings enabled and with dimmed display the energy demand of the S6410 is just 13 (!) Watt! Regarding this aspect it outperforms many ultra-portable competitors, even such equipped with ultra-low-voltage processors (processors optimized for low energy demand). 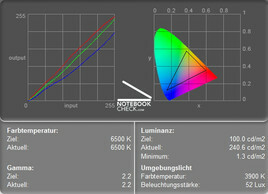 At maximum brightness the energy demand of the subnotebook increases to still moderate 15.3 Watt an. If we also activate Wireless LAN, we can also browse the Internet demanding just 17.6 Watt. 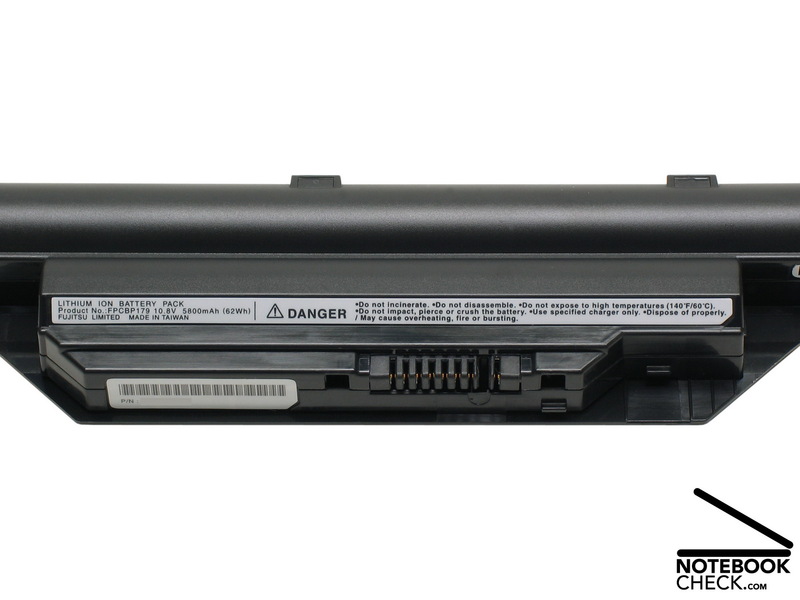 Standard Battery of the Lifebook S6410 02DE. 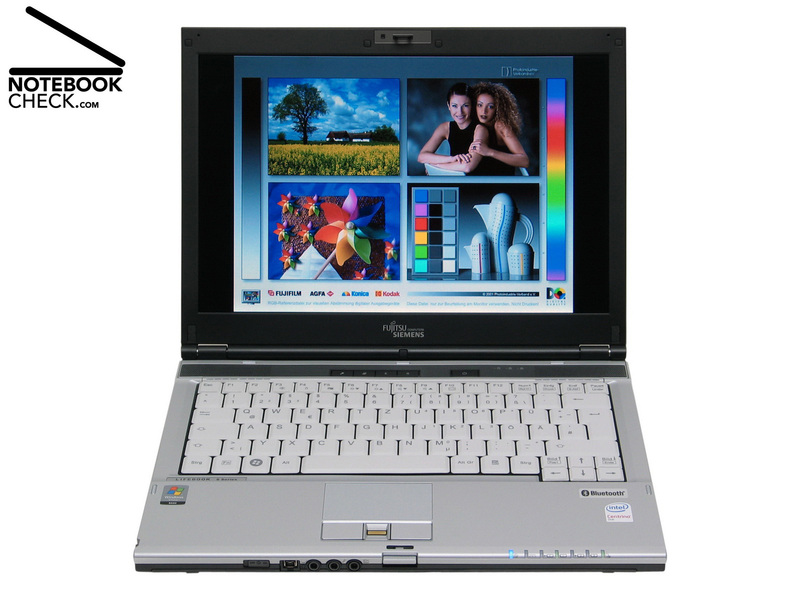 Still, the Lifebook S6410 can also be rather energy demanding. If you configure it for highest performance and run the S6410 under full load, the energy demand is 54 Watt. Equipped with a 62Wh standard battery, the BatteryEater reader still measured an average runtime of 4.5 hours with energy saving settings turned on (WLAN on/ brightness high). This runtime could be enhanced by further energy saving settings. 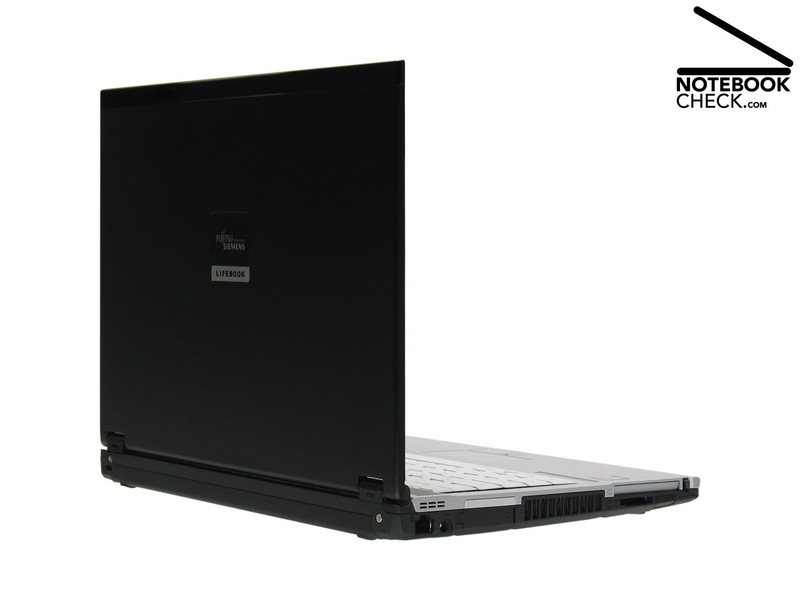 However, the Lifebook S6410 completely empties its battery in about 1.15 hours under full load. If you'd like to work unplugged at high performance a whole day, you should plan to buy a supplement battery for the modular slot right at the beginning. The Lifebook S6410 is a light, compact, and fast Dual-Core-ultra portable notebook with overall good grades. 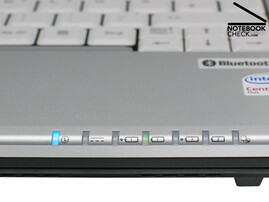 The solid and reasonable design of the case, the security add-ons, e.g., finger print reader, shock-protected hard disk for preventing data loss, spill-proof keyboard, and a modular expansion slot, and, furthermore, the possibility to attach a port replicator make the Lifebook S6410 a general-purpose and reliable companion. The bright and thin 13.3-inch glare type display is alright indoors, however, outdoors its heavily reflecting surface is a disadvantage. Regarding noise and temperature emissions the S6410 is alright. However, sensible ears could be annoyed in very quiet environmentsby by the permanently running fan. 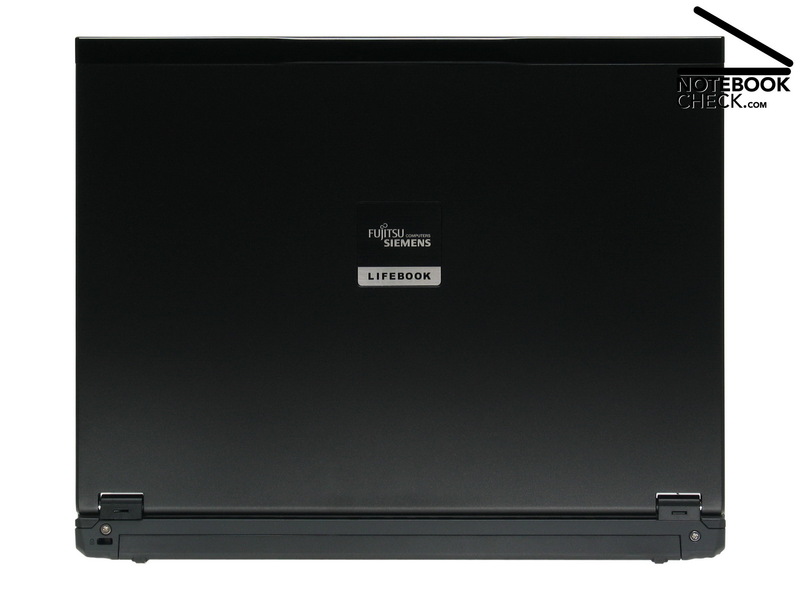 Overall, the Lifebook S6410 is due to a reasonable price/performance ratio a proper notebook for demanding business customers and also for private customers. Focusing on very low weight and really compact dimensions, it also provides up-to-date technology for good office performance. Many thanks to the company Planet Notebook, which kindly provided us with the reviewed notebook. 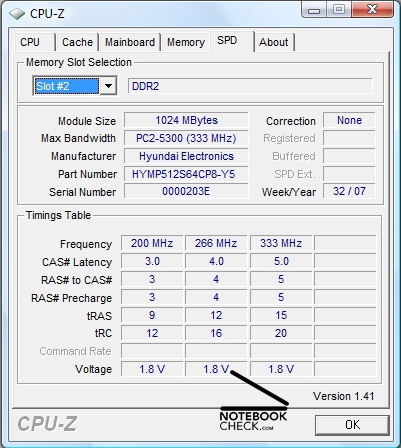 Here you can configure and also buy this notebooks. ...by brightness and energy demand. The viewing angles are typical for this notebook class. Due to a big maintenance cover the S6410 can be easily maintained. The second RAM-slot is still unoccupied and, so, upgrading main memory is easy. Equipped with Bluetooth and Wireless LAN, the S6410 is fit for wireless communication. ..., but, makes cleaning the filter more user-friendly. ...however, the indicator-LEDs for the keyboard are rather small. ...and solid case with small dimensions. 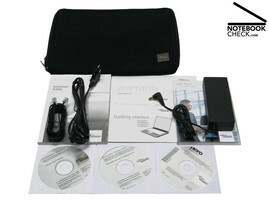 FSC provides, besides recovery media, also an elegant notebook bag as accessory for the S6410. 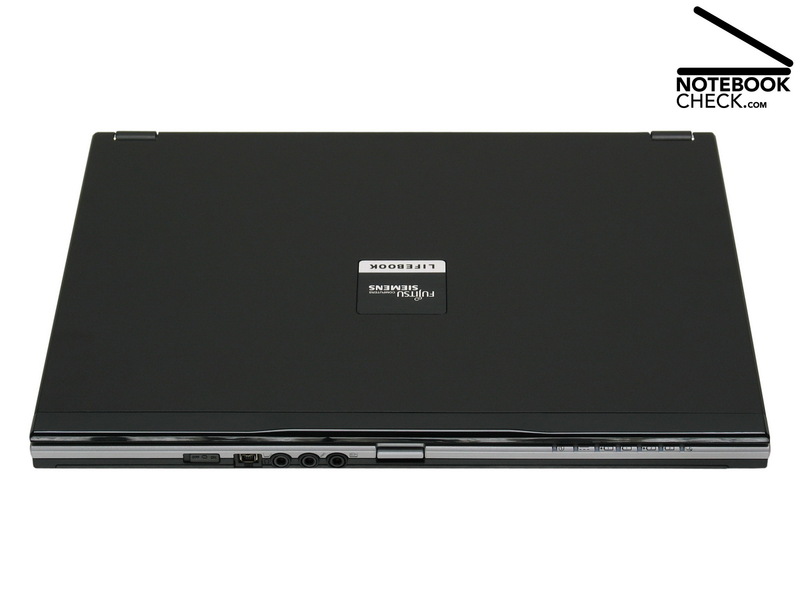 The black and silver design of the S6410 is simple. ...the S6410 also comes with a 1.3-MP-web cam proper for video chats. The 62Wh standard battery is definitely sufficiently powerful. By means of a supplement battery for the modular slot a runtime of a whole working day is possible.